Sir Francis Galton in 1883 wrote in 'Inquiries into Human Faculty' "I will simply remark —First, that the existence of the colour associations with sound is fully as remarkable as that of the Number-Form with numbers. Secondly, that the vowel sounds chiefly evoke them. Thirdly, that the seers are invariably most minute in their description of the precise tint and hue of the colours. They are never satisfied, for instance, with saying "blue", but will take a great deal of trouble to express or to match the particular blue they mean. Fourthly, that no two people agree, or hardly ever do so, as to the colour they associate with the same sound. Lastly that the tendency is very hereditary. " 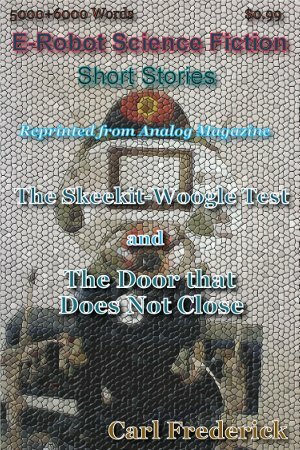 My story, 'The Skeekit-Woogle Test' concerns synesthesia. This is a cross-wiring of the brain where vision, sound, and even smell are mixed up. Some forms of synesthesia cause synesthetes (people with the condition) to see a color when they hear a particular word or to associate smells with shapes. In fact, there are synesthetes with any possible pair of senses coupled. At least one cognitive scientist, Vilayanur S. Ramachandran, Director of the Center for Brain and Cognition at the University of California (San Diego), thinks almost all of us have it in some form. Actually, I got the idea for the Skeekit-Woogle story from listening to the superb BBC 2003 Reith Lectures given by Dr. Ramachandran. This story appeared first in the March 2006 issue of Analog Magazine. An alien, remotely-controlling an android in the form of a young boy, befriends an old professor for the purpose of finding a written record from an alien expedition to Earth in Roman times. The story then, is not so much about a child as it is about the exuberant nature of childhood. Published first in Analog Magazine in June, 2006.